We’d love your help. 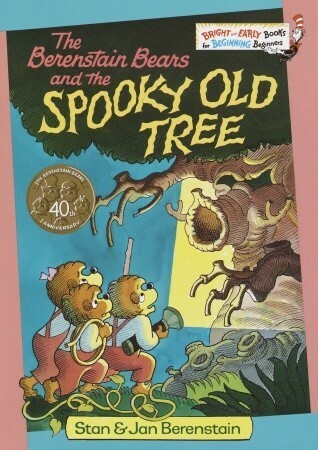 Let us know what’s wrong with this preview of The Berenstain Bears and the Spooky Old Tree by Stan Berenstain. To ask other readers questions about The Berenstain Bears and the Spooky Old Tree, please sign up. what is the story about ? Happy Halloween. I never read this as a child - too bad. This was fun. Very simple. Very Halloween. It is creepy and it still feels safe. This was a huge hit with the kids. They loved it. I'm glad they got introduced to it. Good for age 2 and up. The bears are going through a haunted tree. Shivers ensue. I must have read "The Spooky Old Tree" to my kids a million times. My daughter and son are 12 years apart in age and I still remembered at least half the words to this book when my son was a toddler. I think I have it completely memorized. It's short enough to read out loud without losing your voice and it's fun to do it in a creepy, scary voice. This was my all-time favorite bedtime book. My son loved this book and so we read it over and over again. We owned a copy which I may still have but not sure. Fear. Illusion. Nightmares. A heady mix of rebellion and self-discovery, a bildungsroman of Lynchian proportions, a journey through the darkness surrounding middle America, wading into the murk of the mind, of life, to the farthest reaches of night. Is there joy in this world? Perhaps. Safety? A more assured thing, if accepted as a temporary measure. Yet evil remains, waiting, reaching. Sleep tight, sleepybears. Also, this was the first book I fell in love with, mainly because it also came with a Fear. Illusion. Nightmares. A heady mix of rebellion and self-discovery, a bildungsroman of Lynchian proportions, a journey through the darkness surrounding middle America, wading into the murk of the mind, of life, to the farthest reaches of night. Is there joy in this world? Perhaps. Safety? A more assured thing, if accepted as a temporary measure. Yet evil remains, waiting, reaching. Sleep tight, sleepybears. Kids will love this fun, spooky story. It is spooky enough to be really engaging without being too scary for younger kids. This is a great book for early readers, as the text features short, repetitive phrases and sentences. This book naturally encourages kids to make predictions about what will happen next by asking, “Do they dare...?” Kids can use the bears’ past actions as evidence to help them predict that the answer will likely continue to be “yes.” In fact, the last time the book poses the “do they dare” question, it reviews for the reader all the times the bears did dare to do things. This is a great way of showing how you can use evidence from the book to support your prediction about what will happen next. In addition, this book is full of positional words. The bears go into the tree, up the stairs, through the wall, into the hall, over the bear, up the ladder, through the floor, down a slide, and out a door. The illustrations in this book add a lot to the simple text, depicting the spookiness of the tree, the danger in each step, the consequences of the bears’ choices, and their frightened reactions. -(Page 14) Do they dare? What do you think? -(Page 18) What did he used to have? What happened to it? -(Page 22) Do they dare? Why do you think so? -(Page 26) What did she used to have? What happened to it? -(Page 28) Do they dare? Why do you think so? Love it! My daughter and I love spooky old Halloween looking trees. So what are the cubs gonna do when they find it, go exploring what else. Armed with all the goods, a rope, a light and a stick, they set off. What do they find, the Great Sleeping Bear. This has got to be our favorite Bears book. This review has been hidden because it contains spoilers. To view it, click here. It amazes me how their style of writing changes. Sometimes it’s wordier, and reads like a regular story, some are rhyming, has humor, and is really cute. Other times they're simple. This ended up being the latter. This was overly simple, and not one of their better ones. It wasn’t pleasant to read because of the simple writing, and it didn’t have the humor and charm that a lot of their books have. There was one line that rhymed, wall and hall, yet nothing else rhymed. So that was odd to have the It amazes me how their style of writing changes. Sometimes it’s wordier, and reads like a regular story, some are rhyming, has humor, and is really cute. Other times they're simple. This ended up being the latter. This was overly simple, and not one of their better ones. It wasn’t pleasant to read because of the simple writing, and it didn’t have the humor and charm that a lot of their books have. There was one line that rhymed, wall and hall, yet nothing else rhymed. So that was odd to have there. The three bears start out with rope, a stick, and a light. The questions throughout is always answered with ‘yes. They dare.’ Like will they go in the spooky tree, up the stairs, through the wall, down the hall, over the bear? And it’s all answered with yes, they dare. I didn’t like the repetition of it. It also makes you read in a robotic voice, which isn't pleasant. It sets that robotic tone for the book. There are a couple underlined words that didn’t make sense to underline. If they were putting emphasis on it, it should have been italicized. The first cute thing was how it went from one shivering bear, to two, and you knew it would eventually be all three. When asked if they’ll over the great sleeping bear, it recaps with how they went into the tree, climbed the stairs, went through the wall, into the hall, so of course they were going over the bear. Because they had come that far, they weren’t going to stop there. I thought that was cute. You have to keep up with the illustrations to see what’s happening to the stuff they were carrying; the rope, the stick, and the light, because it doesn’t tell what happens to it in the story. When they get to the stairs, there’s somehow a river with alligators in them. How is it possible that a river is going underneath the stairs that are inside a tree? That’s when the bear loses his rope. Down the hall, sister bear’s stick in split in half by one of the knight’s spears lining the hallway. Brother has his flashlight going over the bear, and in the next scene, it’s suddenly gone, so we’re led to believe it got lost in the shuffle. The escape is far fetched at the end. There’s a very convenient ladder that reaches all the way up to the floor, and then another hole in the floor opens up to a slide that has a door at the end, which shoots them outside. Stairs, halls, ladders, slides, and a pit of alligators is a bit much to have in one tree. Even though this is a children's book, and they might not question anything, I like for it to be at least believable and not so outrageous and impossible. It has a happy, warm ending at the end, with them running home. The last lines are ‘home again. safe at last’ and it shows them running to their mom. However, it felt like the adventure was over before it started. It happened so quickly. It was way too short, and could have used way more words to convey an actual story and adventure. I realized after that the bears weren’t even given names. We know sister and brother, but who was the third bear with them? How can you not name your character? Also, in these books, you know the general layout of the town, their friends, neighbors, etc., yet all of a sudden there's a new neighbor, place, tree, house, that only shows up once and you never see it again. Where is this tree, with this bear, and alligators in their town? This wasn't one of their good ones. Like I said earlier, their writing style changes with each story. You never know what you're going to get. This wasn't one with good writing in it. It seemed like a straightforward story of a spooky tree, but I didn't see any of that coming. It would have been better if it wasn't so far-fetched, and it had been just a normal, spooky tree, and they got creeped out and went home after. This ended up being pretty crazy with everything that happened. Such a shame to give it one star, but it just wasn't enjoyable. This review has been hidden because it contains spoilers. To view it, click here. These seem to be either hit or miss, and this was a miss. This is one of, if not the, worst of the Berenstain Bear books. I don't know what style of writing this is considered, but I didn't like it at all. It repeats the same phrases and sentence structure throughout the book that I find repetitive styles very annoying and tiresome. 3 little bears, light, stick and rope, and "Do they dare...?" I get it, I don't need everything reiterated over and over again. The thing I liked was when they used t These seem to be either hit or miss, and this was a miss. This is one of, if not the, worst of the Berenstain Bear books. I don't know what style of writing this is considered, but I didn't like it at all. It repeats the same phrases and sentence structure throughout the book that I find repetitive styles very annoying and tiresome. 3 little bears, light, stick and rope, and "Do they dare...?" I get it, I don't need everything reiterated over and over again. The thing I liked was when they used their items and then I didn't have to hear about them anymore. It went to one light and one stick, with one having the shivers, and then one light and two having shivers. It started with 3 bears and obviously I know it's Brother and Sister but I had no idea who the third bear was. A name wasn't given and that was so odd. It stood out to me so glaringly and Idk how you could leave a detail like that out. There was literally no point to this story. Usually these come with a lesson but this was all about repetitiveness and no point. They explored a scary tree, the insides making no sense. They slide through the hole in the branch, go through a tunnel, climb stairs, and then all of a sudden there's a crocodile snapping the stairs. Where did a crocodile come from? There was an opening through the tree that looked like it led out to sea. What is this environment that supports crocodiles, with a body of water existing inside this tree? It's outlandish. Then there's a key in the floor that opens a door into a hallway, down some more stairs and there's a huge bear. They wake him up crawling over him, have to climb this ladder, where there's a hole in the floor leading to a slide, which takes them out of the tree. The illustrator on the last page had to make the tree enormous to fit everything that had just happened. It made the whole thing even more unrealistic and far-fetched, because the tree was the size of a house. One of the first books my sons learned to read by themselves. The benefits of this more open-ended tale are in the potential discussion between parent and child. Why did they go to those woods? Can you find a tree like that in real life? Why was the Great Sleeping Bear so different from the other bears? This is one of the earlier Berenstain Bear books, and it shows. The bears are less stylized and cutesy than the bears in the newer books, and the story is halfway between an early reader and the newer, longer read-alouds they do now. It's a cute little story about three cubs going out with a light, a stick, and a rope to explore. Of course, they lose all three items and run screaming home to mom - and with good reason, that spooky old tree is *really* spooky. There are only a few words per page, w This is one of the earlier Berenstain Bear books, and it shows. The bears are less stylized and cutesy than the bears in the newer books, and the story is halfway between an early reader and the newer, longer read-alouds they do now. I always picked this book for my mom to read to me when I was 3 years old. I knew it so well that I would say the whole thing for her instead:o) I still enjoy reading it to my nieces and love the Berenstain Bears. This is probobly the best Berenstain book out there! My kids loved this book. It has been to the "book doctor" so many times that is barely recognizable. It is on my list for my granddaughter, now. One of my children's favorites this book is boxed away for their children someday. How many of us as children looked at an old tree in the dark shadows and imagined it was full of scary things. The Bernsteins address being scared of things we don't need to be scared of. Great story. This book is awesome, yes it is. I will always love the Berenstain Bears. Always. Does anyone else think it was Papa Bear hiding in the tree to scare them? Otherwise why is Mama Bear so cool with them exploring some creepy old tree? one of the shorter bear books, but I thought it was good. Just enough words on the page, and just enough "spooky," for the young child. Brilliant in its simplicity. My Granddaughter loved the book #very spooky for her! She enjoys reading this story since she was 3 years old. Now she is 10 and still loves the book. It is the first book that she could read by herself. She is a very smart girl and loves to read and go to the library with me when she visits. We read a lot of books together. Excellent book for teaching children how to read the feelings of others and understand why they feel the way they do. The pictures are interesting and give you a chance to talk to your children about what happened. Repetitive, overly simplistic pointless robbery book. What? This isn't even-- there's a plot but no point. It's got very few words and it's very repetitive. There are three bears. I can't tell if they're supposed to be Brother, Sister, and Honey or different bears. Well, given the 1978 copyright date, it's clearly pre-Honey, so it's just another bear who's wearing Honey's overalls. They go investigate a spooky old tree. It keeps saying, "Do they dare X? Yes, they dare." And they keep going through Repetitive, overly simplistic pointless robbery book. There are three bears. I can't tell if they're supposed to be Brother, Sister, and Honey or different bears. Well, given the 1978 copyright date, it's clearly pre-Honey, so it's just another bear who's wearing Honey's overalls. They go investigate a spooky old tree. It keeps saying, "Do they dare X? Yes, they dare." And they keep going through weird things in this creepy house that's kind of like a haunted house and they get more and more scared. At the end there's a giant bear and they crawl over him and he gets mad and chases him, and then they run back home, and that's the end. There's no real point. Pretty much everything is interchangeable. The characters are interchangeable. The plot points could have happened in any order. It's really not very interesting and the author didn't try very hard in writing a story. There's not even any reason for them to be in this Spooky Old Tree to begin with. The best part: when they climb over a giant, sleeping, naked bear. That would be equivalent to climbing over a large, sleeping naked man in their world. It's just a weird thing to do. And it reveals the whole exercise as home invasion. This book is about three little bears and their adventure up and through the spooky old tree. They go up twisty old stairs, moving walls, to wake a huge sleeping bear. To get away from the bear they run and go up a ladder, through the floor, down a slide and out of the tree and run all the way back home. The illustrations in this book really make up the story. This story could probably be told without the text, because the illustrations provide so much detail that the text does not provide. For This book is about three little bears and their adventure up and through the spooky old tree. They go up twisty old stairs, moving walls, to wake a huge sleeping bear. To get away from the bear they run and go up a ladder, through the floor, down a slide and out of the tree and run all the way back home. The illustrations in this book really make up the story. This story could probably be told without the text, because the illustrations provide so much detail that the text does not provide. For example when they little bears go up the stairs the text simply just says that they dares to go up the stairs, but the provided illustrations show them going up the stair, but right as they reach the top, an alligator jumps up and snaps part of the stairs in its mouth. I think this book is a good book for children, when I was a kid I enjoyed reading the different Berenstain Bears books and watching the show, show I think other children will enjoy reading this story. This is a good book to teach direction and it is also a good book for children to use their imagination. Berenstain, S., & Berenstain, J. (1978). The Spooky Old Tree. New York: Random House. Summary: Three little bears decide to leave their house one night and go exploring. They find a spooky, old tree and climb inside it. However, they discover there is a lot more inside the tree than they expected and one-by-one each little bear becomes more and more frightened. After running into alligators, spiders, and big sleeping bear, somehow the three little bears find their way out of the tree safely and back home. Theme: Sometimes our expectations for something can be completely wrong, an Summary: Three little bears decide to leave their house one night and go exploring. They find a spooky, old tree and climb inside it. However, they discover there is a lot more inside the tree than they expected and one-by-one each little bear becomes more and more frightened. After running into alligators, spiders, and big sleeping bear, somehow the three little bears find their way out of the tree safely and back home. Theme: Sometimes our expectations for something can be completely wrong, and we end up experiencing something different than we thought.